In 1999 Congress passed the Newborn and Infant Hearing Screening Intervention Act. This act was passed to ensure that children were diagnosed at an early age so that appropriate intervention could be effective immediately. Infants are now screened in the hospital at birth before being discharged. Every year, 2 to 3 out of 1000 children born in the US are born deaf or hard-of-hearing. The prevalence of infant hearing loss has been shown to be greater than that of other diseases and syndromes also screened at birth. Early identification and intervention is critical and can prevent psychosocial, educational, and language difficulties. It is very critical to identify an infant before 6 months of age. If identified during the birth to 6 month time frame children are more likely to develop normal speech and language development. Otoacoustic emissions: A miniature earphone and microphone are placed in the ear, sounds are then played and a response is measured. If the baby hears normally, an echo is reflected back into the ear canal and is then measured by the microphone. 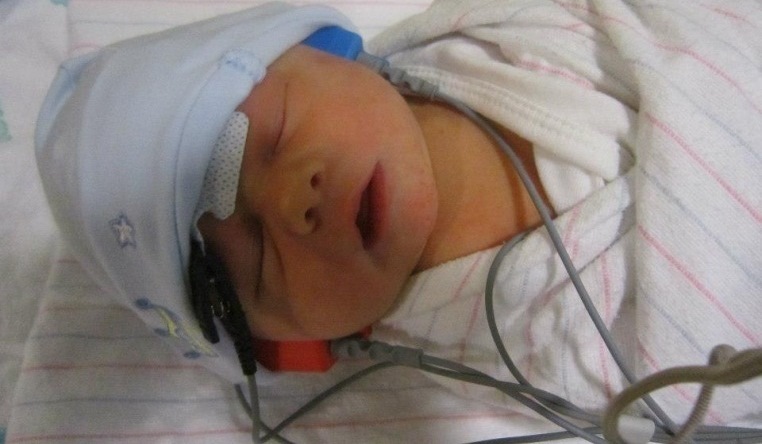 When a baby has a hearing loss, no echo can be measured on this test. Auditory Brainstem Response: For this test, sounds are played to the baby’s ears through inserted earphones. Electrodes are placed on the baby’s head to detect responses. This test measures how the hearing nerve responds to sounds and can identify babies who have a hearing loss. While newborn screening has become standard in hospitals across the United States, follow up hearing screening has note. According to the NIH, almost half of babies who do not pass their newborn hearing screens are lost to follow-up. For more information and statistics on Newborn Hearing Screening you can visit the National Institute of Health’s website or contact us here at Hearing Rehab Center.